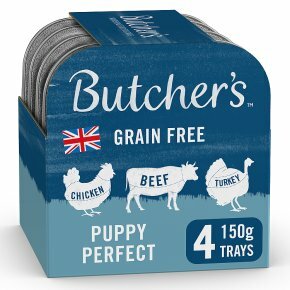 Daily Feeding Guide Number of 150g trays per day 128kcal / 150g Dog Size: Toy: Up to 3 Months: 1-3, 3-6 Months: 3-4, 6-12 Months: 3-4 Digs Size: Small: Up to 3 Months: 1-3, 3-6 Months: 3-4, 6-12 Months: 3-4 Digs Size: Medium: Up to 3 Months: 1-3, 3-6 Months: 3-4, 6-12 Months: 3-4 If mixing with complete dry puppy food replace 150g of Butcher's with 35g of dry. Make sure there's always fresh drinking water nearby. This is a guide only and will depend on breed and activity level so you may need to adjust the amount given. Best served at room temperature.